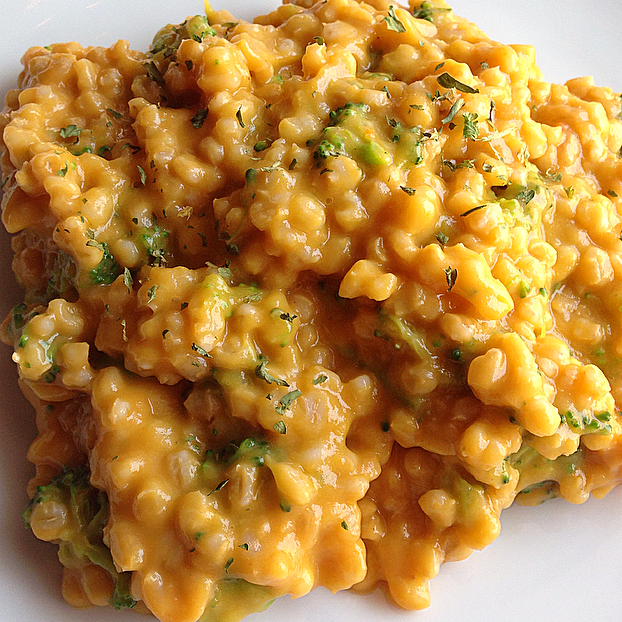 Vegan Butternut Barley Risotto || Dairy-Free, Egg-Free, Fat-Free, Oil-Free, Vegan – Live Kind. Eat Kind. One grain I don’t see used too often is barley. I think it’s one of my very favorites and it’s really so easy to make. You can use barley in soups, salads, in place of rice or meat in just about any dish, or just by itself it is so nutty and delicious! Barley is high in fiber, and has been proven to help prevent type 2 diabetes, breast cancer, and gallstones. It’s among the list of the world’s healthiest foods. I came up with this recipe the other day playing around with a few of my favorite vegetables and flavors, creating a super creamy, savory, satisfying sauce to coat my cooked barley creating a “risotto”. To cook your hulled barley, add 3 cups of stock to 1 cup barley in a large pot with a pinch of salt and bring it to a boil. Once it’s boiling stir well and turn the heat down to a simmer. Continue to simmer for 40 minutes, stirring occasionally. Take off heat and cover for 10 minutes, then “fluff” well. To make your sauce, add all ingredients to your high speed blender or food processor and blend until smooth and creamy. Pour sauce over your barley and stir well. Add in your chopped broccoli and mix well. Salt and pepper as desired! I also added parsley flakes on top. It would be great with fresh parsley mixed in! My husband enjoyed this so much, I think it will now be part of our Christmas meal. I hope you all are able to enjoy this week and the holidays with the ones you love! I wish everyone a very Merry Christmas! Hi. This looks AMAZING! 🙂 I’ve been looking for a great vegan risotto recipe to make for one of my friends and with the holidays here, I think you’ve got the golden recipe! Thanks for the inspiration. Happy holidays! Oh thats awesome! Thank you so much. 😊 I really hope you enjoy it as much as we do. Happy holidays to you!! I hope it’s wonderful! Yum! Great recipe for the holidays. Happy holidays, SBV! Thanks so much! Merry Christmas!! Looks yummy and easy. thanks for sharing. Yum, I love this idea!! Oh great!! I hope you enjoy it! Risotto is one of my favorite dishes in every which way and I make it with barley quite often. Your version looks delectable!